I attended and spoke at the December 4th Goleta city council meeting at which they brought forward an urgency ordinance to ban the operation of on demand scooter sharing services (Lime, Bird) in the city of Goleta. November is wildfire season in California, and this year has been no exception. Just when we thought it couldn’t get worse than 2017 / 2018, it did. Unfortunately it can be super hard to get good information about wildfires while they are happening. This is mainly due to every local news station eagerly exploiting tragedy for readership. Googling a fire returns pages of poorly and hastily written articles that contain, at best, out of date information (but plenty of shocking cell phone video) and at worst no information at all. Simple Virtualenv Auto Activation With ZSH. Since I moved from fish to zsh, one of the main things I missed was virtualfish. I’m not sure how any serious python developer lives without auto activation, as in automatically activating the virtualenv for your project when you open a terminal or cd to it. Here is a script you can use to achieve auto activation. It doesn’t require virtualenvwrapper, pyenv, or anything like that. Just use python3’s built in python -m venv to create a virtualenv in ~/.virtualenvs/, use the provived venvconnect function to connect the activated env with the current directory, and you’re done. # Auto activate a python virtualenv when entering the project directory. #       Connect the currently activated virtualenv to the current directory. echo "Activate a virtualenv first"
Source the above script in your ~/.zshrc and you should get auto activation of python virtualenvs. The lines we make in our day to day lives. Placed on a heatmap of all our motion, our daily routines show up in blazing hot purple. We ride down the same streets on our way to work, walk the same sidewalks to get the groceries, wander familiar shorelines on sunset strolls. Ever heard of grml-zsh-config? Maybe not, but it’s possible you may have used it. It’s the zsh config for the Arch linux installer, as well as some Debian systems. Grml is a nice alternative to heavy and bloated config frameworks like oh-my-zsh and pretzo (even on a modern machine I’ve seen zsh take over a second to load using oh-my-zsh with just a few plugins enabled). Unfortunately, grml is not that easy to configure, and the available documentation is a little lacking. With a few tweaks though, I managed to get a proper shell out of grml. 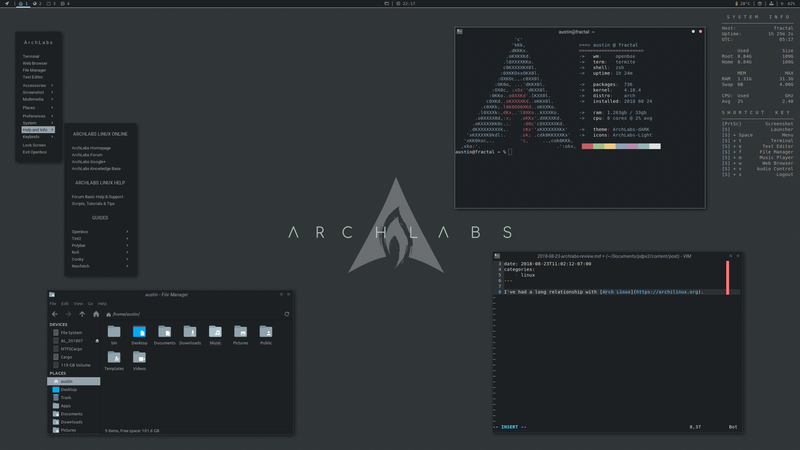 Today I’m writing a review of the ArchLabs linux distro. Have you ever wanted a badass Arch linux install, complete with an openbox window manager, conky, and dark gtk themes, worthy of the top spot on /r/unixporn? Of course you do, but if you’re anything like me, you’re a busier person than you were when you were 15, and you no longer have the time, or the inclination.